 Charming and insightful tales about the ten-plus cats that share a bustling household with Caras and wife, Jill, on their 35- acre rural Maryland farm, Thistle Hill. Caras (A Dog Is Listening, 1992), currently the president of the ASPCA and the author of numerous fine volumes on pets and wildlife, never seems to run out of choice material. 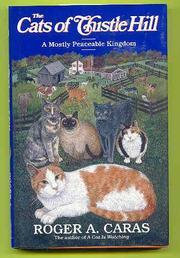 Here, he sets about discovering what his cats do ``with a whole world of a farm to explore'' and reports back on their adventures. We learn of Omari, a marmalade-and-white tomcat who stalks marshes and woodlands and returns to his owners' front door not with captured prey but with captured sticks; of an oversized Siamese adoptee, Teddy, who transforms himself from hater of all four-footed creatures into fabulous foster dad to three abandoned kittens. We also find out that the Thistle Hill cats interact surprisingly well with the other animals in the Caras menagerie. And it is a menagerie: The farm is home to over 30 pets (almost all of them rescue cases), including dogs ranging from big bloodhounds to tiny terriers, several captive-bred macaws, a donkey, a llama, some horses, two heads of cattle (one of which is named Steakums), and an alpaca. Throughout, Caras waxes philosophical about the nature of cats (``They can't look ahead, but can they look back?'' he ponders), comments on responsible cat ownership (cats should be spayed or altered, he says, given shots, kept indoors in city or suburban settings, and never abandoned), and gives useful tips on deterring destructive feline behavior (furniture scratching, refusing to use the litter box). ``We are one big happy ark,'' says Caras about his Thistle Hill family, and for cat lovers, this is one big enjoyable read.